I am always on the lookout for hands-on learning opportunities for my kids. And I especially love science. So when I recently came across this Back to the Roots Oyster Mushroom Kit for growing our own mushrooms. I was intrigued. 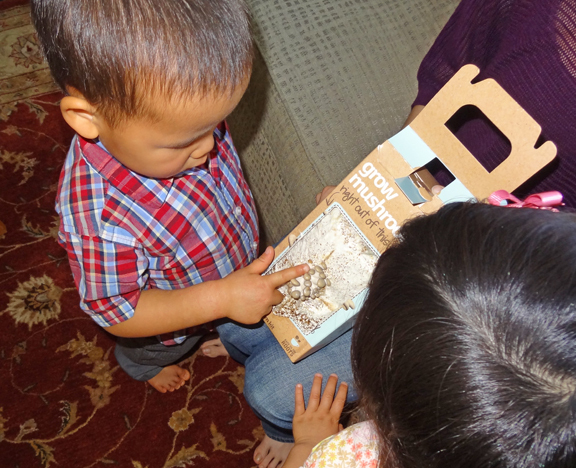 I’m not a big mushroom fan myself, but I thought it would be a fun experience for the kids to see how mushrooms grow. Note: For more science resources and activities, please see my science activities for kids page. After receiving our kit, we followed the directions by cutting a cross in the bag and soaking it in water overnight. The kit says the mushrooms grow in about 10 days. So we waited. I’d honestly given up hope and the only reason I hadn’t tossed the kit in the trash was due to sheer laziness. But then one day, I noticed some tiny mushrooms beginning to sprout! The kids were very excited. 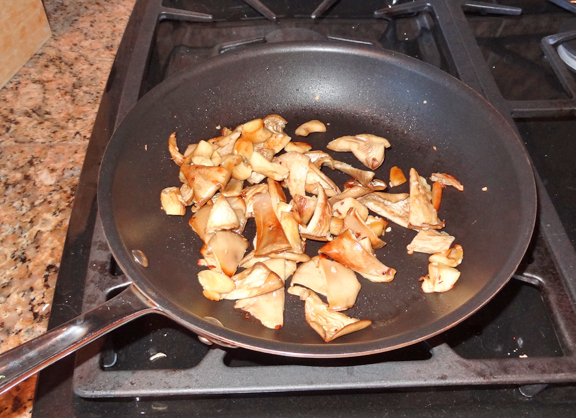 Eventually, we harvested the mushrooms and cooked them with a little garlic and oil for a delicious mushroom stir fry! The kit promises at least two crops, so now we are anxiously awaiting the next growth (and we are being much better about spraying the kit :-)). You can buy the Back to the Roots Oyster Mushroom Kit from Amazon or through the supplier Back to the Roots. Oh wow really is growing mushrooms really that easy? That’s the kind of thing I need. Yes, it was super easy! No green thumb needed (which is a good thing since I definitely don’t have a green thumb)! A fun one for the kids, I wonder if growing them would get mine enjoying eating them? Great timing! We have been reading library books about mushrooms and we just made a toadstool house for our toy fairies. My kids would love to grow their own mushrooms (then maybe I could convince them to try one?). Thanks for sharing. I popped over from Teach Me Tuesday Linky party. This is so cool! I love that you were able to eat them too! Thanks for sharing this at Teach Me Tuesday at Preschool Powol Packets!! Oh, I’ve always wanted to do that! My son would love the squirting, so I’ll have to consider actually doing it. The picture of the mushrooms cooking is making me hungry. Wow – neat! I stink at keeping things alive (other than my kids). 🙂 This looks easy, though! That is crazy! So cool. I would love to see if we could grow mushrooms from the mushrooms you get at the store. Thanks so much for sharing! I really like the idea of growing mushrooms from store bought mushrooms; we do that with green onions. Something to look into for sure. I will have to look into those. My husband loves mushrooms (even though no one else here will touch them)! They would be fun to grow though; thanks for sharing at Mom’s Library! 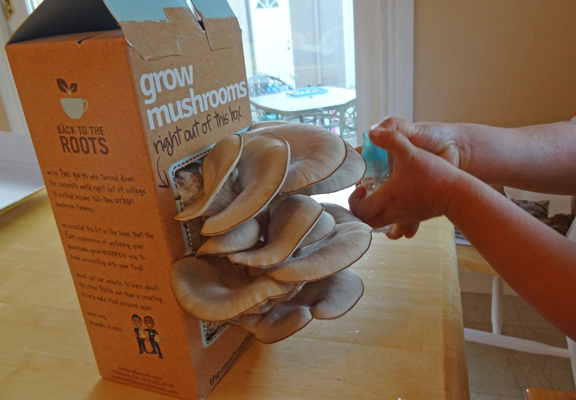 I had no idea you could grow mushrooms like this, could be one to try especially as my kids also love a spray bottle! Oh yes, it was really cool to witness. They took a while to get started but once they began, they grew like crazy! 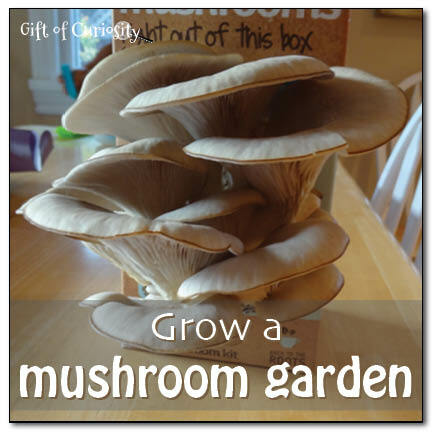 I seriously want to grow mushrooms now because of this post! Thanks for inspiring me and linking up to the Hearts for Home bloghop. 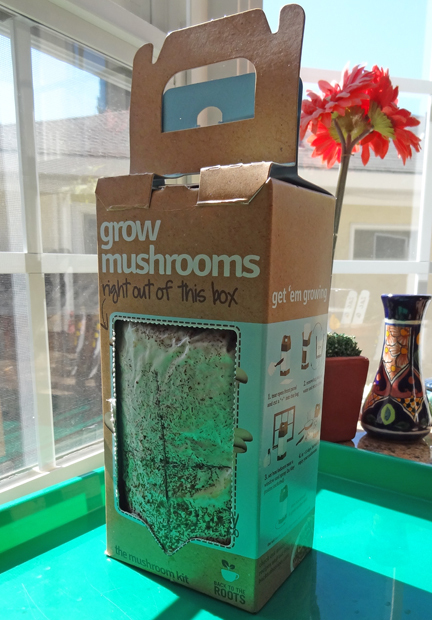 Thanks for the feature, and enjoy growing your own mushrooms! I want this! I will be buying this when my husband finds a job! What a great project. Thanks for sharing on It’s Playtime!